Yeah, I know, I know, I’ve been quiet for a while. Life grabbed me and shook me and threw my world into dizzying, spinning spirals. This post will outline everything that’s happened, and update you for my plans in the future. For starters, I’ve been on an exercise/eating regimen. It started with me dropping my soda habit at the end of Feburary, and, within 7 weeks, dropped 18.5 pounds and gone down almost two pants sizes. Talk about an image change, huh? 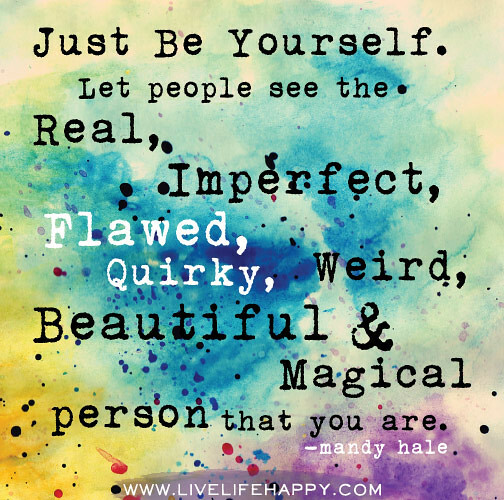 About those Affirmations… Working on supplying those in an alternative way. That’s all I can say now. But, you will be getting a lot of them. A VERY BIG lot of them. At the end of March, I returned for the annual Smoky Mountain Writer’s retreat, a small, week-long getaway with about 20 author friends filled with intensive writing sessions every day, reading segments afterward, and alcohol. Lots and lots of it. No worries though, no alcohol for me. Or, at least other than a small milliliter of pineapple moonshine in a mouthwash cup. Which, for alcohol, was really good. I pushed myself so hard I was almost in a deep breathing fetal position by the end. But, I ended up writing 36,000 words on a brand new WIP within six days. The view was gorgeous as well, overlooking a chasm deep in the Smoky Mountains of Gatlinburg, Tennessee. I also went for a 3 mile hike up and down steep inclines on my free day (so hot and out of breath by the end). My mentors (yes, Tee and Pip were there also. They were the ones that forced me to go last year. I regret nothing at this point) went with two other Smokies (Katie Bryski and Hugh O’Donnell) to the Titanic museum, which apparently was a blast! We all had an amazing time, and the first day we were all home and back to reality and day jobs, Alex White (amazing cover photographer/designer, check him out if you want a personally photographed cover), who is the organizer, coordinator, and resident leading bad@ss, had already picked tentative dates for next year’s retreat. At the same cabin. That had a hot tub AND a giant Jacuzzi. Yeah, it’s that cool. Anyway, got to hang with tons of old friends and make lasting new ones. And, to me, they’re not just friends anymore. They’re family. I’ve booked plane tickets for me and my boyfriend to go to Las Vegas and Arizona next month to see his mother, who he hasn’t seen in over two years. I’ve got a surprise in store for him, which he’s knows I have one in store, but doesn’t know all of it. I’m excited to do this, and he won’t know until we get on our plane in Chicago. Can’t wait for his reaction. Yes, you’re seeing correctly. The first-time author guest and fairly-new-to-publishing-world author with social anxiety has to moderate TWO panels. Just have to keep telling myself I can do this. … I can do this, right? Anyway, I hope to be updating this blog with posts about each of the panels I’m on, as well as some of the panels I will be sitting in the audience at. If you’d rather see it live or recorded as video, like my author page on Facebook (link). I am planning to Facebook Live parts of the convention, so you guys can keep up with the action. Did I forget anything? No, don’t think so. Wait… Right, right. There will be big news hitting the blog soon, hopefully by the beginning of June. 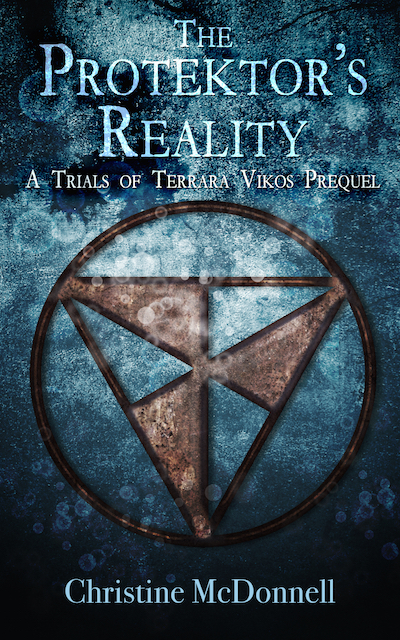 Stay tuned, and, if you want to have advanced preparation, go to the “My Works” tab here on Terrara Vikos, and download/purchase the stories and/or prequel. For future reference, the stories go in time order (#1-4), ending (so far) with The Protektor’s Reality prequel novel. Wish me luck, guys! I’ll be sure to keep you posted. Lookie here! Posting after only a week! Woo! I made a few commitments this new year, instead of resolutions, as inspired by my amazing mentor, Tee Morris (link). The idea is that we always believe that it’s okay for resolutions to fail, so, when ours do, we shrug it off. Tee suggests instead making commitments, ones which we feel obligated to see through. One of mine is to blog more frequently. Another is to get my next book published. Yes, this is my earliest alert. It’s not certain yet (There will certainly be a blog post once I know definitely when it’s happening), but it’s my commitment to myself, so I will see this through to the best of my abilities. One of the things I’ve always struggled with was editing my manuscripts. Writing the stories themselves comes easy. Tweaking it (or, in the case of wanting to be published, cutting out its heart with a spoon), is a much more daunting task. My novels are my babies, as many writers and authors out there can attest to. We put our heart and soul into creating these universes and characters and plots that always take a huge amount of love and care to create and maintain. But, then, in order to be the most competitive, we need to rip it to shreds, because, apparently, it’s not good enough as is. At first, this was a hard thing for me to accept. When I started my journey into becoming an author almost twelve years ago, every bit of poetry/story I wrote was praised. Most couldn’t believe a middle school/high school student could write that well or that maturely. It built up my confidence in my writing abilities, one of the only things in my life I have confidence in. The upsetting fact is that we are biased. When we write our first draft, we are blinded by this amazing world and in-depth, painfully-realistic characters we created all by ourselves. We have to come to the realization that, yes, this is a wonderful story, but is it the best for us, or the best for the story itself? It’s hard to come to terms with, because we can only see things from our own perspective, the one which created the story we fell in love bringing to life in text. Beta readers are one of the best resources you could have. You can get help from people who you can trust will give you an unbiased review, with advice and tweaks in plot and flaws. The best part about these guys is the fact that they can look at it with fresh eyes. They have never met these characters before (or, in the case of a second or third book, never seen the situations they are about to), and can give a perspective of your prospective readers. 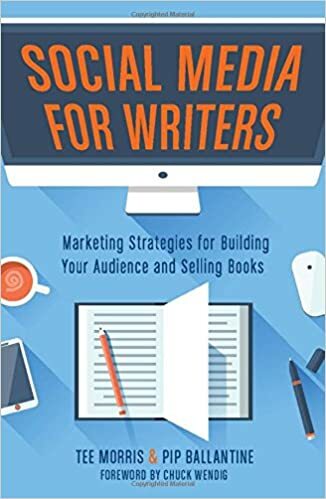 You want your prospective readers to like it, right? take their advice then. Now, you don’t have to accept all their advice, but give their ideas and views a serious think-over before deciding on the edit. They can be your best friend, or your mortal enemy. But, they have the best skills necessary to pound your precious baby into a strong, believable novel that will appeal to many (hopefully). That’s right, I’m talking about the cursed EDITOR. Now, don’t get me wrong, some of my nicest friends are editors. But… They scare me! I’m terrified of editors, because you hear about the fatal pen all the time as a starting out writer. 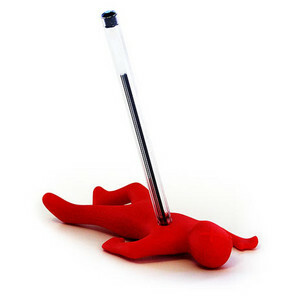 With all the marks of the Red Pen of Death, destroying everything you’ve poured a bit of yourself into. However, an editor just wants to make your work better. Their goal, believe it or not, is not to tear you, or your story, down. It’s just to help it be the best it can be. 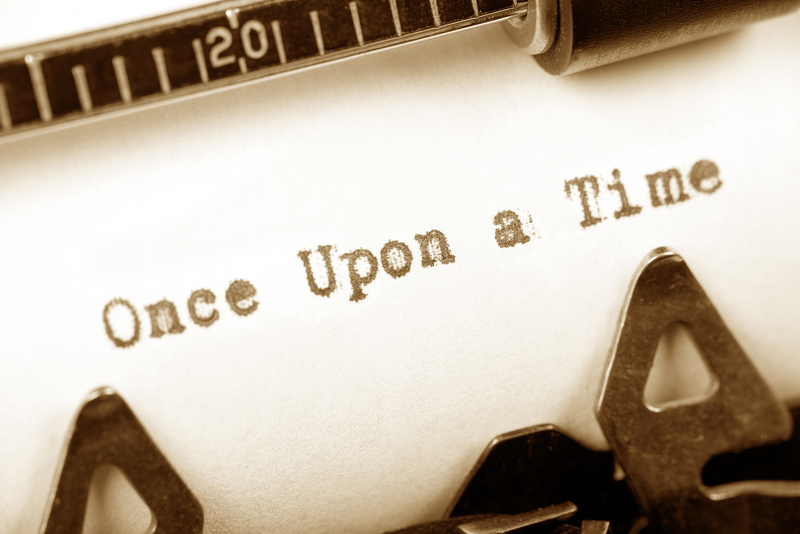 And, sadly, the best story it can be is not your first draft. Also, just like betas, you don’t have to accept every change they make. And, most will not be offended. 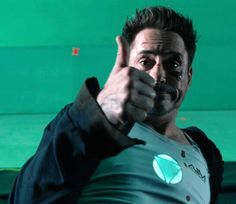 In the end, you know what’s best for the story as a whole, but sometimes, it takes a skilled, outside opinion to gain a new perspective on the greatness your manuscript can become. This is the best advice I can give. When you are so blinded where you can read your story over and over again and see nothing wrong but a few missed commas or an capitalized T, you need to stand up and walk away for a while. My current project I’m editing, I haven’t touched since May of 2015. Back then, it had been five months since the last edit, and I apparently went to town on it. I didn’t even remember making immense edits on it until I opened the document this week to do more. In fact, the first chapter, the very FIRST paragraph, had things added that I hadn’t remembered even thinking of adding. The best part? And, if the prologue was made better after a five month break between December 2014 and May 2015, imagine how much I can make my story better after an eight month hiatus. In fact, just this week, my word count has been fluctuating, and I’ve been tweaking and editing, because, while I still love my characters and the universe I’ve created, I am not blinded by the stadium lights of a deviously tricky first draft. My goal is to publish the best story my novel can be. In order to achieve that, I need to edit. We ALL need to edit. In the end, our opinions don’t really matter. Our readers do. The story will still speak for itself. Those big plans will have an announcement of their own in the near future, once details have been finalized. But, I guarantee you, they are BIG. At least for me. 🙂 I’m planning on writing on here more frequently, but don’t hold me to it. 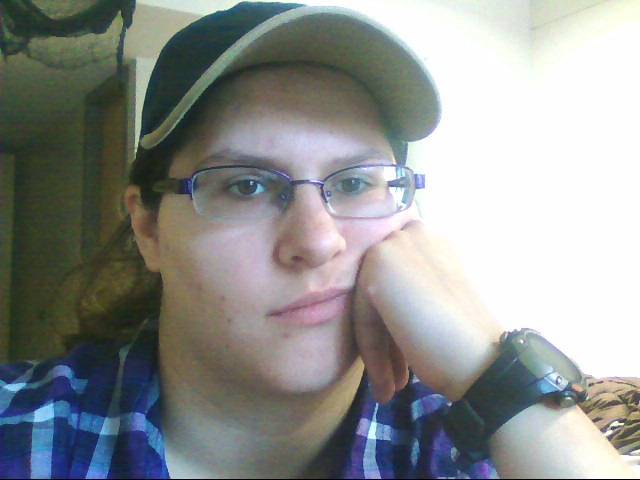 I may have a sprained wrist from all the typing I’ll be doing soon. Anyway, this post isn’t about me. It’s about two writers, with a hope, a dream, and a Kickstarter. These two writers are Tee Morris and Pip Ballantine. They are not only my friends and mentors, but also my role models and idols. (Lucky me, huh?) 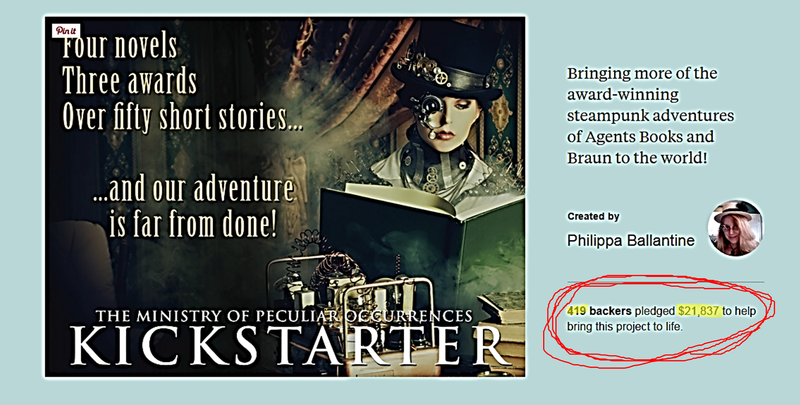 They initiated a Kickstarter in the hopes of self-publishing book 5 in their popular Ministry of Peculiar Occurrences series, titled The Ghost Rebellion. While I have loved their writing pre-Ministry, the MoPO series has always had a close place in my heart. I love the characters (the main characters are my favorites. Wellington, because I think he’s cute when he’s nervous. and Eliza, because she’s a fiery loose cannon who doesn’t care what others think [a trait I wish I had]. Just my opinion though), I love the intricate plots, and I love the firepower (explosions, gun fights, advanced cars that certain characters underestimate at first *coughcough*Eliza*coughcough*). The storylines are so well written and had me hooked during that first scene in Phoenix Rising, with my chills mirroring the ones the characters were having in that cold tundra. Anyway, the Kickstarter started out strong. They had bursts here and there, with some weekends gaining upwards of a couple grand between Fridays to Sundays. 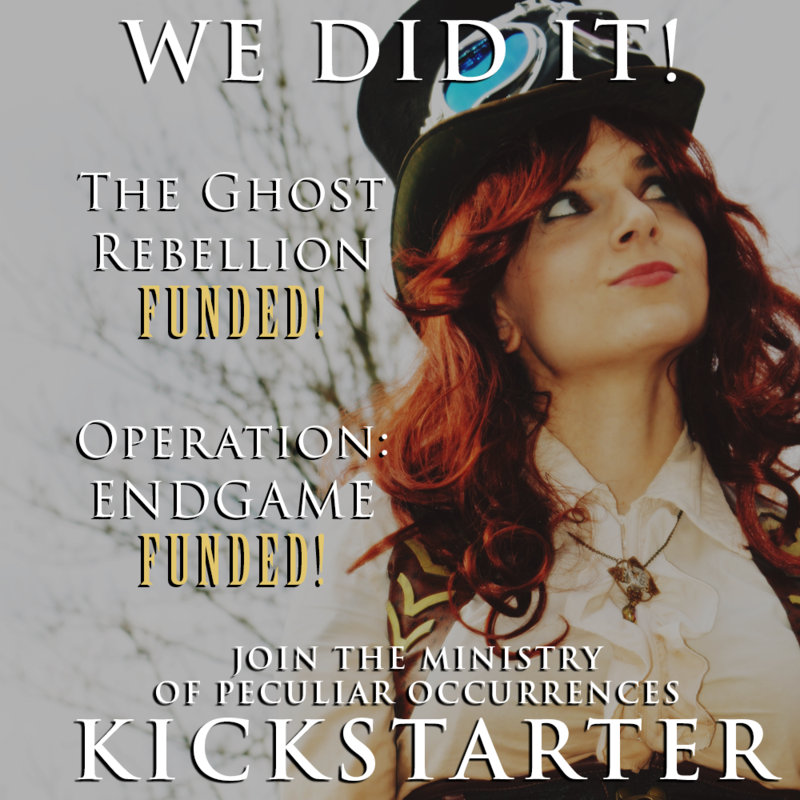 They actually reached their initial $6000 goal, which ensured the publication of The Ghost Rebellion. As the Kickstarter progressed, they reached their first Stretch goal, to get specific cover models for TGR, very soon after. Last Sunday, they reached their next stretch goal, which, my friends, was to be able to publish the SIXTH and FINAL book in the MoPO series, OPERATION: ENDGAME!!! It wasn’t until then that the Ministry ‘journalists’ started getting excited. Via Periscope, they uncorked champagne, made a fire pit, and lamented the lack of marshmallows. They started talking about Countless Hues of Crimson, with vague, interest-peaking details coming to light. That goal would become reality at $20,000, a full 5 Grand from their Operation: Endgame goal. Can you imagine my eyeroll of disbelief? I have told them for YEARS how big the Ministry was. You’d think they’d know by now, but they still doubted their abilities to write an unbelievable story full of twists, turns, and the adventures of two unlikely agents. Remember, I told them from DAY ONE that they had enough support that they could do this and THEY STILL DOUBTED!! Followed by an appropriate GIF. I have not let him forget it in the last 24 hours. It’s actually kinda fun, and though I know it annoys him, I do it for a reason. I want him to remember this amazing, unbelievable victory whenever he doubts his writing. I want him to remember earning over 21k in 30 days using nothing but the power of the MoPO fans and the epicness that is the internet and social media. As Lucian would tell him, “Keep Faith.” All he has to do is keep faith and know that what he does has made a difference in not only his life, but has made an impact in the lives of many others, as seen by the results of this journey. It’s been a wild ride, and it’s only going to get wilder. To Eliza and Wellington, I can’t wait to see the end of this adventure. To Tee and Pip, congrats on such a sweet-tasting victory. I’ve been thinking about lots of stuff lately. Between work picking up pace, my friends and sister getting ready to graduate, and a death in the extended family, I’ve decided to reevaluate my life. My life as a new author has been rough. I’ve been monitoring my sales page, which has been very depressing for the past few months. It made me wonder if I made a bad decision in self-publishing this novel. I’ve also thought about sending copies to review bloggers, but my mind does something to me every time I debate about an action. I have this OCD trait where I want everybody to like me. It doesn’t matter if I see or talk to someone for a few seconds in my entire life; I want that person to like me for those few seconds. It’s become such a paralyzing problem, because then I second-guess my thoughts. I walk on eggshells, trying to ensure that each person I meet or interact with doesn’t have negative thoughts about me and my behaviors and mental/emotional state. The thing I’ve come to realize recently, is that you can’t please everyone. You will always have haters, especially if you put your work out for the world to see. It comes with the job, and it’s something I’ve struggled with since Day 1. I need to refocus on my dream, what I want, and how to get there, and not focus on the negativity that my mind creates for me. Being a pessimist has always come easy, the true challenge is getting past that. Despite the scenarios my imagination creates to scare me, I have always been optimistic about my dreams. I have always hoped to be partially-successful as an author. I always hoped I would sell tons of copies of my books, to prove to myself that I’m a good writer and that others enjoy the stories I have created. The following lyrics are from a song that was released only a few days ago, by an AMAZING Youtuber named Tyler Ward. It’s an original song he wrote (and he had another video showing him going through the songwriting process for this very song), and it was perfect for what I had been thinking about for the week prior. So, for the others of you out there that have regret your decisions or lose faith in your dreams, “Try not to care what others think,” and have an Optimistic heart. Just keep trying. You’ll get there someday.